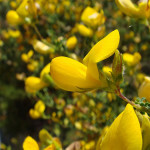 A shrubby, yellow flowering broom which grows to 4 metres. The flowers are in clusters distributed along the branches. The leaves are three lobed, held on short stalks along the many fine branches which are ridged and green. The short, straight seed pods are densely covered in silvery hairs. Prefers shady areas such as stream sides, also seen on mountain slopes and in cork woods. Distribution: South West Spain, southern Portugal. 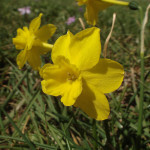 This scented, bright yellow narcissus can grow to 40 cm tall. The central cup (corona) is flared and fluted with 1 to 5 flowers per stem (most frequently 2), supported on a long tube. 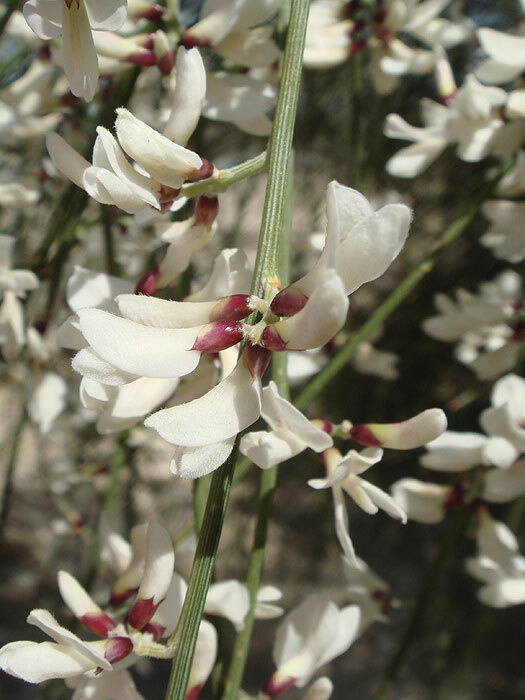 The erect leaves are around the same height as the flowers; they are smoothly curved on one side and indented with a groove on the other. They prefer fields that are undisturbed and very humid during the winter. Distribution: Rare and very localised, South West Spain. 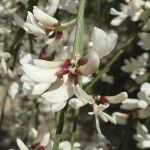 Multiple fine branches drape from this elegant shrub, during March it is smothered in small white, strongly scented flowers. Each pea type flower has a red calyx. 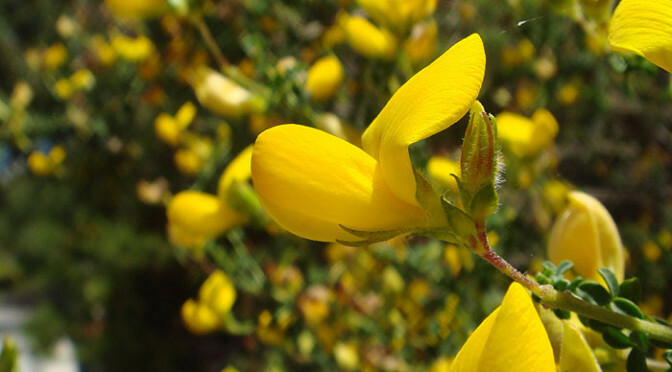 It can reach 3 metres in height, spreading to double that in width. The few leaves soon fall from the slender green stems. 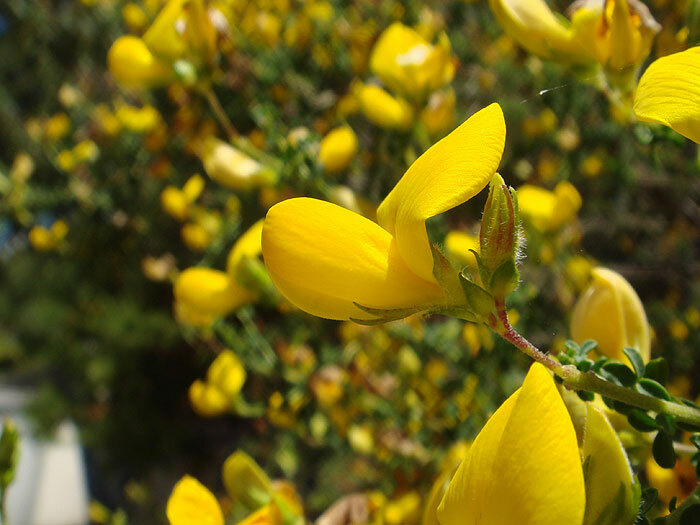 More frequent in coastal dunes nearer to the Atlantic area, here it is planted to decorate the roadsides. Distribution: South Western Spain, Southern Portugal and Northern Morocco. 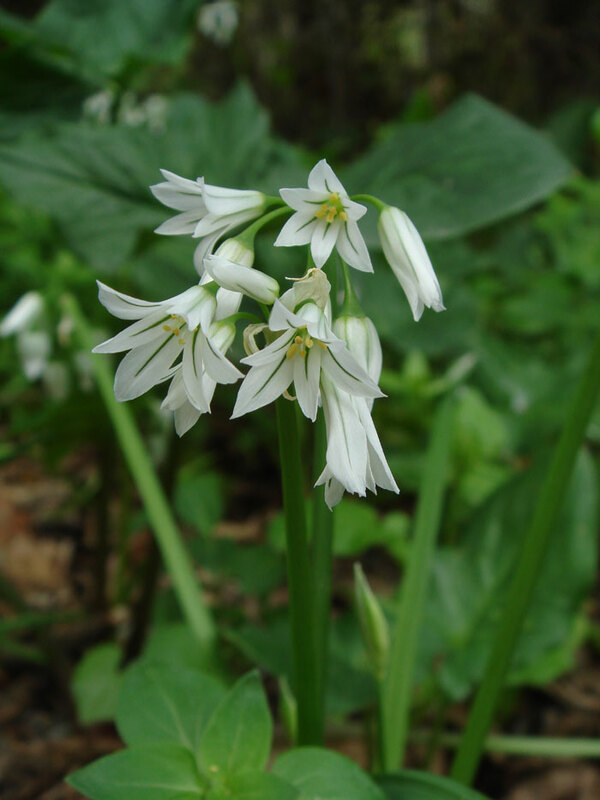 This small plant has 5 to 15 white flowers with a green midvein, they hang noticeably to one side. 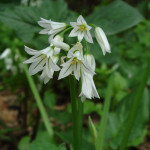 The common name comes from the odour when a leaf is crushed and the shape of the flowering stem really is three sided. Dense tufts form from tightly packed bulbs; the green leaves are smooth on the upper side with a keel (central ridge) on the reverse. They generally prefer damp, shady areas such as stream sides, ditches and woodlands. Distribution: Iberia eastwards to Italy. 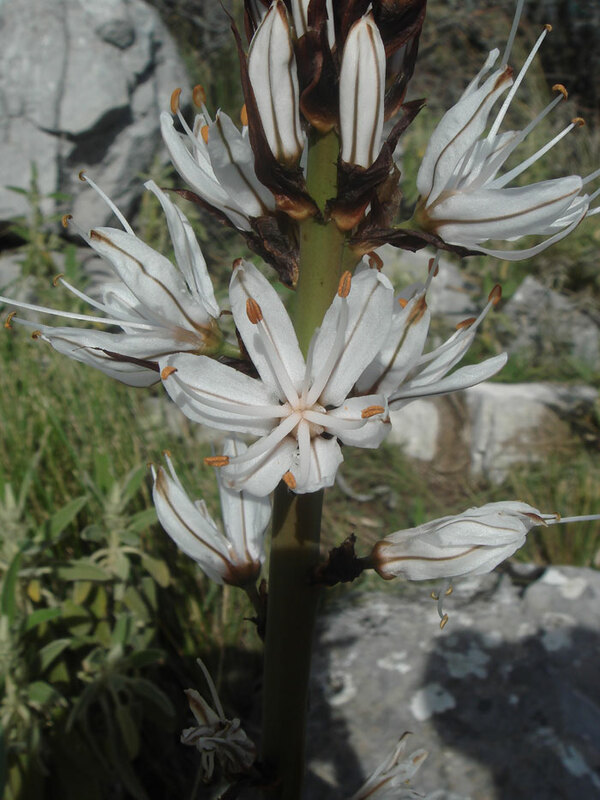 Tall flower spikes to around 1m in height adorned by white flowers. 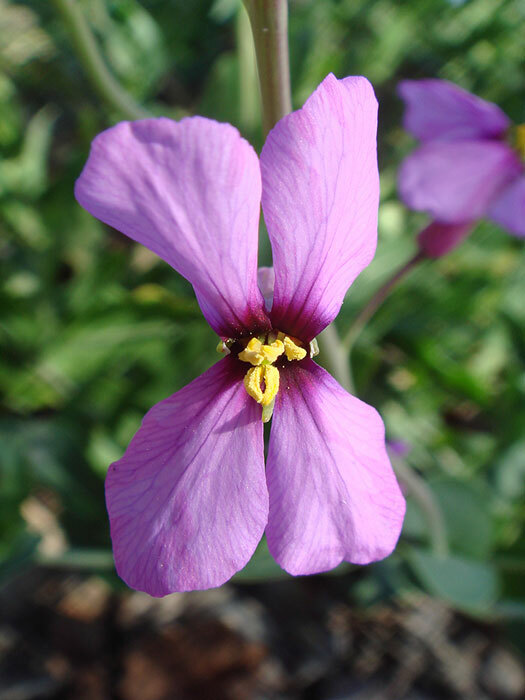 Each star shaped flower has a brown stripe on the reverse of the 6 petals. 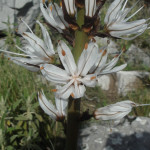 It differs from the Branched asphodel in only occasionally forming branches, its papery bracts are a conspicuous dark brown and it is more frequent at higher altitudes. The leaves are grey-green, sword shaped and in lax clumps. Seen amidst limestone outcrops and in high pastures, it is unpalatable. Distribution: Mediterranean area. 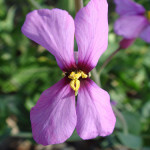 Small violet flowers, of four petals with a darker centre, decorate this finely branched plant. The leaves are grey / green and thickened. It can grow to around one metre tall and create large colonies, although it is often more scattered. 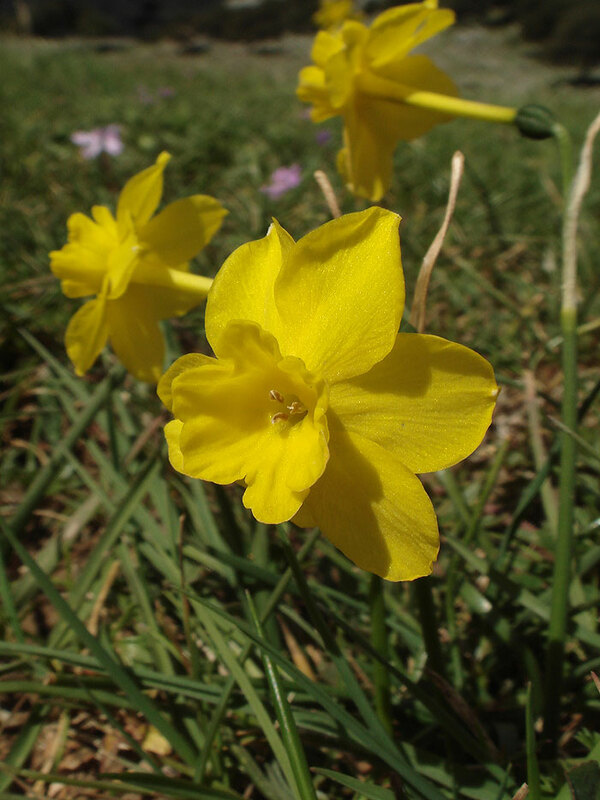 It grows mainly in clay soils on roadside banks, field edges and uncultivated ground. Distribution: Eastern and southern Spain.